Come spring semester, UCF Police officers will carry Naloxone, an antidote to combat heroin overdoses. Although heroin use has not been a problem at the university, Director for Health Services Dr. Michael Deichen said that this step will put UCF ahead of the curve. The decision came after timeshare mogul David Siegel's 18-year-old daughter Victoria fatally overdosed on prescription drugs in June. Since then, the reality-television star has worked to reduce drug use on college campuses, with an Orange County task force and now UCF. "I decided that her legacy was going to be that I couldn't save her life but I'm going to save thousands or even millions of lives, and I dedicated my life to ... doing just that," Siegel said at a press conference Friday morning. "When I first started on this journey, I thought there wouldn't be anything for me to do that isn't already being done. And I found out nothing's being done." That's when he came across Naloxone, what he called the "greatest miracle drug ever invented." FDA-approved, the drug is administered through an EpiPen-like tool and can counter central nervous system depressants such as heroin. At first, officers were apprehensive of using the tool, picturing scenes of Uma Thurman in Pulp Fiction, said UCF Deputy Chief Brett Meade. Rest assured, no John Travolta reenactments will be necessary, as very little force is required to administer the drug. Officers got the chance to practice with needleless training versions Friday morning. It comes in a metal contraption smaller than an iPhone, and has been tested to last up to two years in all sorts of conditions. To use, a first responder pulls off the top and then a second covering where the needle would be, and injects the antidote in the thigh. The gadget literally talks the user through the process and counts down from five once the needle has made contact. From there, an overdose victim would have 90 minutes to be transported to the hospital. Through a grant, the UCF Police Department has received 150 doses of Naloxone, said spokeswoman Courtney Gilmartin. The tricky part is identifying if someone has overdosed; however, the antidote poses no threat to those who aren't on drugs. "It's completely harmless," Siegel said. "Let's say they're on the floor sleeping and you thought they were overdosing, still give them a shot and it won't hurt them." Often responding to cases of alcohol abuse, officers were instructed to look for symptoms of drifting consciousness, constricted pupils, limp body and abnormal respiration. They should also be aware of other clues, such as syringes or suspicious substances. When something happens on campus, UCF officers are usually the first ones on the scene, Meade said, and those minutes before EMS arrives with their own antidotes are crucial. "That's the minute between severe brain damage or death and little effect or little effect," said Thomas Hall, Director of Wellness and Health Promotion Services. To date, more than 10,000 overdoses have been reversed with Naloxone in the hands of non-medical personnel — merely a dent in the 17,000 people who die every year from drug overdoses. The reality is, Hall explained, heroin has gotten easier and cheaper to get. Orange County Sheriff and Task Force Co-Chair Jerry Demings previously said that, as of July 2015, his department had dealt 162 overdoses and 30 deaths related to heroin, compared with 57 overdoses and 27 deaths in 2013. That's why Siegel is pushing for even more legislation. "Every medicine cabinet in the country should have Naloxone in it, and every time a doctor gives a prescription for an opioid, he should give a prescription for Naloxone," said Siegel, who is working to pass a bill for these policies. It would piggyback off a piece of legislation that passed earlier this year, the Emergency Treatment and Recovery Act, which provides immunity from liability to first responders who administer emergency opioid antagonists. 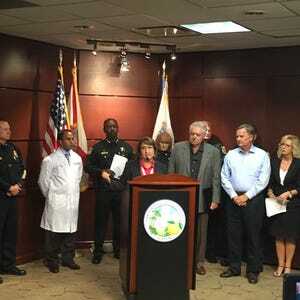 The UCF Police Department is the second university agency in the country to arm its officers with this drug. The Boston University Police Department announced its plans to carry Naloxone after responding to about a dozen opioid overdose calls in eight months. Siegel originally met with university officials in August in hopes of implementing a random drug-testing program for students; however, UCF declined, claiming such a program would be a violation of constitutional rights. On Friday, he called UCF's new mission a "breakthrough." Caroline Glenn is the Content Manager of the Central Florida Future. Follow her on Twitter @bycarolineglenn or email her at caglenn@gannett.com.